Maliki and Iraqi officials met with Vice President Joe Biden Wednesday at his home in Washington for an in-depth discussion of current threats, according to the official, who spoke to reporters on a conference call on the condition of anonymity. On Friday, Obama and Maliki will continue to hash out ways for Iraq to better counter fighters associated with the Islamic State of Iraq and the Levant, an al Qaeda-affiliated group whose leader is thought to be based in war-torn Syria. That effort could include equipment and weapons sales, and the sharing of intelligence, according to the official, who said Iraq's current resources don't allow the nation to effectively target al Qaeda insurgents in the western part of the country. "What we don't want the Iraqis to do is just take a security-centric approach to this," the official said. "What that means is making sure they have information in terms of where people are located, where it's coming from, where the funding is coming from, and that's something we can do pretty effectively," the official continued. "So we're trying to help them now as best we can, and that's going to be a key topic of discussion over the course of the visit." The U.S. supports separate weapons and air defense systems in Iraq, and a delivery of U.S. F-16 fighter jets is still planned for next fall, the official said, noting Iraq had just submitted a deposit of more than $600 million after signing a contract last year for them. U.S. officials are also asking Iraq to do more to end Iranian shipments to Syria's regime that utilize Iraqi airspace, a request originally made by Secretary of State John Kerry seven months ago during a surprise visit to Baghdad. "We'd like them to do more," the official said of Iraq's progress on ending the over-flights from Iran. You wanted us out, we're out! Now take care of yourself! Not one more drop of American blood!!! Not one more drop!!! it's funny to me that's many people have no Idea about Iraq's situation talking like an experts in this field. What do you know about the Shiites and the Sunnis beside reading about them in the yellow press?? first, there is a strategy agreement between Iraq and it's ally The United States.Plus, Iraq pays for this weapons not for free. Second, We was fighting same people (al Qaeda) in Iraq for 9 years. and now you accuse Al Maliki being a killer and he's fighting the same people we fought befour, is that mean we are a killer too? third, who allegedly said that Al Maliki marginalized the Sunnies and Kurdish in west and north of Iraq. I'll said go and check who's the president of Iraq (Kurdish) and how's the vice president's from ( is sunnie) who't the speaker or the house (sunnie) two of the vice prime minister one from sunnie's and the other form Kurdish.more than half of the government shared by sunnies and Kurdish. but still saying they are marginalized. Also, I don't think any state can do a relationship with any country has animosity with United State or by and sale merchandise. I don't think any state can do that with out the prove of the federal government. but the kurds do that. they produce and sale oil without the knowledge of the federal government. I have question for the people how they are against selling Iraq new weapons: what do you want to do with some people they come and wearing explosive vest or driving a bomb car with attend to kill hundreds of innocent people just because they have different religious believe from you? Gee Saif, just what do you take us for anyway? First of all, Iraq was not united by the Iraqis themselves but by the French and British in 1919 in order to get that country's oil. The British promised the Kurds a right to set up their own home state only to renegue four years later. Al-Maliki is only a puppet of the Washington government waiting to carry out it's orders. It's time for each of these distinct ethnic groups to go their own way! Dear Sent. I was hopping that you use your power to help that country to be united once again not to be divide.especially you visited it many times. But I was wrong. And every country have all kind of religons and believes, is that a good reason to you to divide them? I hole no one will be mad from my comments because I think everyone should have enough information about the setuation before he start talk about it. This guy is corrupt and stupid like Karzhai. Both want the US out of their territories, but cannot handle their own problems. If Maliki let the rest of Iraq govern without alienating them because of their ethnic backgrounds, Iraq might not be like it has today. What Obama needs to do is to get Noor al-Malaki to set up some kind of timetable for the Kurds in the north to secede from Iraq and then divide the rest of that country between the Shiites and the Sunnis in the south. Otherwise this current violence will only continue! Of course, this never occurred to Obama nor any of his thick headed, right-wing henchmen! Well said, daf. Thank you. @daf ...spot on! Well said, now lets hope the president and congress listens. So, Pres. 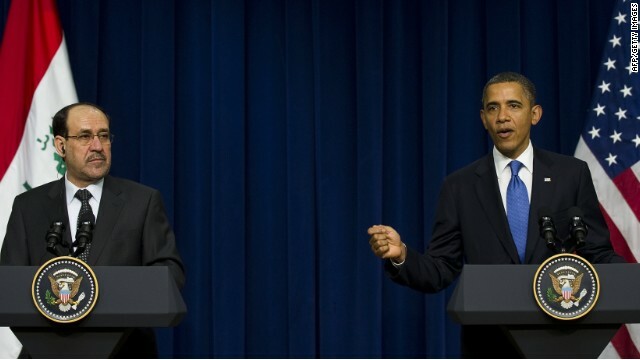 Obama and Prime Minister Nuri al-Maliki are going to sit down and compare notes! Wonderful. Our own government is stale mated by two opposing political parties that can't tolerate each other, much less hold any kind of meaningful "discussions". Iraq is doing the same, exact thing! So now we propose to give al-Maliki intelligence and military resources so he can be more successful in his pursuit of bigotry and discrimination? After all the billions we spent, and so many of our people killed and maimed "freeing" Iraq, this is what we achieved? It is truly heart breaking to see Iraq bring back centuries of hatred and want the US to support this mess! Iraq, Syria, Libya, even Egypt simply cannot function without a strong dictator! Centuries of hate and violence cannot be stopped at the "ballot box". Sorry, but these countries are simply not ready to live in "freedom". The last time I looked no members of congress were wearing bombs to work so StanCalif it is no where near the "SAME". al-maliki is a dictator that is serving Iran regime orders. With his policy, Iraq will go to the civil war very soon. The same thing that happened in Syria with supporting of Alassad regime by Tehran regime. Well said. Maliki is a puppet of Tehran. Too bad, we lost nearly 5,000 brave men and women and spent trillions of dollars so that this murderer could ride to power on America's shoulder. History will judge Bush 43rd pretty harshly. But will be more unforgiving to Obama for losing Iraq to Iran. You're both wrong, alexander and nima. Noor al-Maliki is no more that a puppet of the U.S. government and rules Iraq as though it's still a U.S. colony just as the Communists ran Poland after WW2 for the Russians. As long as Iraq remains united, there will be very little peace there. This is rather irrelevant since Iraq is more than a U.S. satellite state like Poland was to Russia between 1949 and 1989. It appears that this proxy occupation is not quite the good idea as the right-wingers in Washington thought it was!!! the purpose of this visit Al Malliki to get the approval from US government to support Al Maliki for renew another 4 years , because the election gonna star next April . Al Maliki he gonna be new dictator soon , he don't care about bad situation every day 20 people killed and more than 40 injured , hes interested to grow up his power and increase his fortune. the Iraqi people suffering during Saddam and now also suffering the same thing.